There are about 7100 volcanic edifices of various types, sizes, age, and conditions in Kamchatka. They all have been formed over the last 2 to 2.5 million of years. More than 800 edifices are located on the Kuriles. The majority of the formations is poorly studied, though the active volcanoes that pose a real threat to population and infrastructure are studied better. These are volcanoes that have produced at least one dated eruption over the last 3000-3500 years. There are 70 such volcanoes within the Kurile-Kamchatka zone, which is about 15 percent of total number of all active volcanoes in the Pacific Ring of Fire. Many most active volcanoes of the Earth are located in this zone. They annually produce 3 to 5 explosive eruptions. The volcanoes in the Kurile-Kamchatka island arc produce about 20 percent of world total volume of the erupted material. The Volcanoes of Kurile-Kamchatka Island Arc information system (VOKKIA) will join all data on geology, geophysics, volcanology, petrology, geochemistry etc. available for the volcanoes in the Kurile-Kamchatka island arc and the adjacent waters. The VOKKIA system has been designed as a part of the IVS FEB RAS Geoportal since December 2010. Top priority objects of description in the designed information system are active and potentially active volcanoes, as well as volcanoes, which were active in Holocene (over the last 10,000 years). The VOKKIA system is based on data from scientific publications, the IVS FEB RAS information electronic resources, information releases on eruptions and volcanoes activity issued by Kamchatkan Volcanic Eruption Response Team (KVERT), and data from Internet sites of other scientific organizations. For more detailed information please see About System section. 05.09.2017 Opened access to the “Map of night infrared sources (volcanoes and fires)” geoservice. The map was obtained by the Nightfire algorithm using multispectral data of the Suomi-NPP satellite. 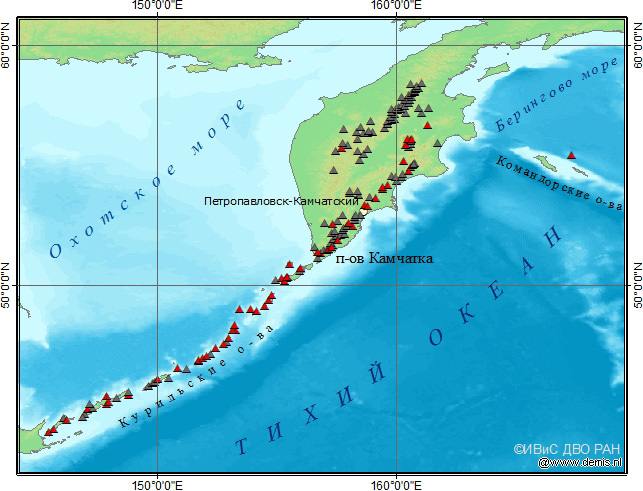 06.10.2015 Opened access to the “Holocene volcanism of Kamchatka” geoservice. Geoservice includes sketch maps showing Holocene volcanic vents and deposits.